Santa falls victim to the Bah-Hum Bug virus and hackers leak his Naughty or Nice List. Will everyone get coal? Watch what happens when Santa, his son, and the North Pole elves team up to save the holidays in 3 great new ads created by Grey SF. 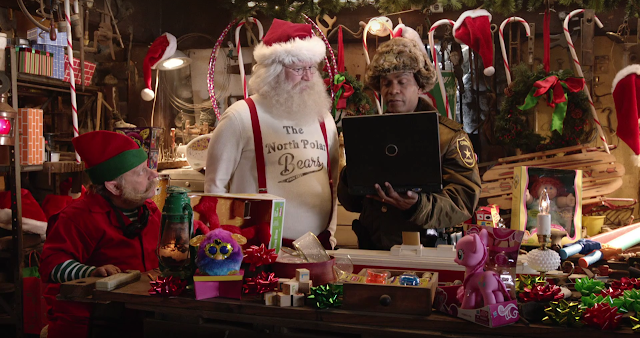 Slim Pictures Director Jason Headley brings Santa’s worst nightmare to life in a three episode spot by Grey San Francisco for Norton security. The online ads chronicle Santa’s reaction to a laptop infected with the “bah-humbug” virus that has taken his Naughty and Nice list for ransom. Headley began with Emma Brooke’s sharply written script and infused his droll humor into the writing. Using a clever mix of comedy and frustration, the resulting campaign shows how even Santa can be pushed to his limit under a cyber attack to demonstrate that no one is safe from online security hacks this holiday season. The first of the three episodes sends Santa into a panic when he discovers that his list is gone and even the police can’t help him, leading Santa to begrudgingly call on his son for technological assistance. In the next episode, Headley draws out a humanization of Santa’s emotions showing Kringle stress eating while his son reprimands him for not keeping his computer system up to date. Weaving in sly humor to explain the importance of laptop security, Claus Junior tells his unknowing dad, "In here, people aren't who they seem to be. It's like those guys who dress up like you at the mall." The final episode reveals a spiteful Santa insisting his elves prepare coal for stockings around the world in retribution, until his son convinces him that the spirit of giving should prevail, ultimately saving Christmas for one and all.